This is a guide to the benefits you receive during your first 60 days on island. Have a question? Ask the Facebook Group. 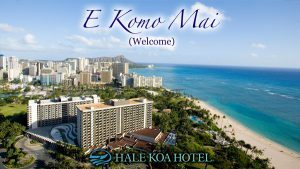 If you can stay off base, stay at the Hale Koa! You get all of these benefits at the same time. Since you live in a hotel while house hunting, your BAH is pure extra cash that you can use to help you get started on the island. Add in any per diem you save back while house hunting, plus COLA, and it’s reasonable to make an extra $1,400 every 10 days while looking for a home. It’s surprising that TLA, COLA, and BAH are paid at the same time, but it is perfectly legal. I’ll cover each of these allowances in detail below. Side note: If you are moving to Hawaii you should check out the Amex Platinum card which offers free access to airport lounges, hotel upgrades, and many other travel benefits, but the annual $550 fee is waived for military. See my post on it here! The only “bad” news is that may need that extra money if you decide to live off base. Let’s say you rent a home for $2,500 a month. Your landlord will likely require one month’s deposit, plus first month’s rent up front. So within 30 days of arriving on island you may have to pay $5,000 to move into your house! That’s a big expense. We personally used the extra money to pay back the cost of shipping our second car from South Carolina, as we had already saved up for a security deposit. The military only pays to ship one car to Hawaii, unless you are a dual military couple. TLA is an OCONUS allowance provided to offset “more than normal” expenses while searching for a home. It is provided in 10-day increments and is based on number of dependents and current per diem rates. Check in with your base housing office to start TLA. They provide a checklist to track homes you look at while house hunting. To continue receiving TLA, you need to show you are actively looking for a home on or off base. When calculating per diem use Local Meals + Local Incidental. Of course you will only be paid actual lodging costs. So in this case, $265.50 is the max. Note: If your assigned quarters contain facilities for preparing meals (e.g. small kitchen with a stove), your per diem (not lodging) is reduced by 50%. Something to keep in mind! Base Housing: If you are assigned base housing but cannot move in for three weeks, then your TLA will continue until base housing is available. Renting a Home: Once you have the keys to your home then TLA ends. If you sign a lease, but the home is not available for 10 more days due to cleaning or old tenants moving out, then your TLA will continue until you can actually move in. Purchase a Home: If you purchase a home you can use TLA until you get the keys and move in. So if you purchase a new home and it is not available for three weeks, you should receive TLA until it is available. Not actively searching: If the housing office feels you are not actively searching for a home, then they can terminate your TLA. You need to show you are looking at reasonable homes. The maximum available time to search for a home is 60 days. I’ve heard that some housing offices complain as you approach the 60 day mark. Assigned to Barracks: If you are assigned to on-base barracks you may not receive TLA at all if quarters are available when you show up. Should you stay on or off base while house hunting? Most military will need a base lodging non-availability letter to seek a hotel off base. I would definitely stay off base if it is an option. You can’t beat getting paid to stay on the beach at a hotel such as the Hale Koa or Hilton Hawaiian Village. However, there are a few drawbacks to staying off base. High food costs at the hotels in Waikiki will eat into your per diem. In addition, parking could cost you around $18 to $30 per night! You will not be reimbursed for parking; it will come out of your per diem. Finally, driving in and out of Waikiki is a pain and can add a lot of time on the road while looking for a home, or driving to your workplace once you report in. 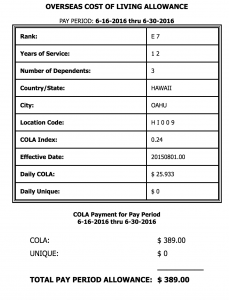 COLA is an entitlement while stationed in Hawaii to help offset the high cost of living. It ranges from about $500 – $1,500 a month and is determined by rank, time in service, number of dependents, and whether you are assigned to barracks. Overseas COLA (which includes Hawaii) is NOT taxed. The example screenshot below shows that an E-7 with 12 years of service, and three dependents (wife and two kids) receives $389.00 each pay period, or $778.00 per month in COLA. COLA is adjusted once a year, so it may change during your assignment. While in Hawaii you receive standard BAH rates for a US zip code (Pearl Harbor is 96860). Though sometimes considered an “overseas” move, you do not receive OHA while stationed in Hawaii. The chart on the next page shows BAH rates for the island of O’ahu, where almost all Hawaiian military bases are located (Pearl Harbor, Hickam AFB, Schofield, MCB Kaneohe, Fort Shafter). BAH in Hawaii has gone up significantly over the last five years. An E-7 with dependents received $2637 in 2012, but will receive $3075 in 2014. If you stay on base, privatized housing will take your entire BAH as payment for base housing. If you are dual military, they will take dependent rate BAH, and provide a single rate payment for the lower ranking spouse. Of note, if you are promoted while in base housing, they will take the higher BAH for the next rank as well. As a side note, base housing in Hawaii is a good deal money-wise. Utility costs are very high in Hawaii. Receiving free electricity and water on base saves you a lot of money. I hope you found this guide useful. Scroll below to see the BAH and TLA charts. Please contact me if you see any errors or this document, or have a different experience with one of the benefits. Email with any questions on moving to Hawaii. I’m happy to help. Sign up for an expanded eBook version of this guide! How Much Money will I Make if I Join the Military? How does it all work out on the other end…moving from Hawaii to the mainland? Do we still get BAH with our 10 days of TLA? What if the hotel is more than our TLA rate..can we just pay the difference? Great question! Yes, you receive up to 10 days of TLA when you depart Hawaii. That is addressed in the DoD TLA frequently asked questions (#9) located here: http://www.defensetravel.dod.mil/site/faqtla.cfm#Q9. First of all, you need a letter of non-availability to stay of base. But yes, if your hotel is more than your TLA then finance will pay up to your allowance. My family was allowed up to $265 per night when we left, but ended up staying at the Aulani for $299 per night for our last 5 days. Finance just paid us the max allowed. It was awesome! hi, so what is the set up if you are dual military?can we combine our lodging?and also what if we are undecided yet weather we want to live on post or off post?or do we have to decide right away? I tried to find an answer on your dual military question but the Joint Travel Regulation is not clear. I am emailing Hickam AFB reps and will let you know what I find out. As for deciding to live on or off base, I believe every service handles it differently. But for Air Force you can look around on and off base to see what your options are. You do not have to decide immediately. Also, you remain on TLA if they offer a home on-base but it’s not available yet. Ok just talked to someone and they said you would both receive lodging allowance at the single rate (if you stay off base). They will only reimburse the actual cost of the hotel. You would also both receive meals at the single rate. So overall what I’m hearing is YES you will receive dual-TLA while searching for a home. is there any down fall if u buy a house in hawaii? No there’s not a downfall if you buy a house. Your TLA will end once you get the keys to the house. I will be moving to Hawaii after my fiancé and I get married. He’s already stationed in Hawaii (Marines) will the TLA still count for us? We are wanting to live on base, it will just be him and I and our dog. I believe the housing office will ask you if your husband already has a place, and if you plan to live there. If the answer is yes then you will not get TLA. You would likely only get TLA if you are moving to a new place due to you moving in with him. It’s been a while since you asked this question. Care to update us on what actually happened? How do they calculate the BAH if I leave my family at my last duty station. Geographical Bachelor? I am E-7 with 18 Time in Service. Your BAH almost always goes to the duty station you are assigned to. So you should get Hawaii BAH regardless of the BAH rates at your previous duty station. The only time I have seen exceptions for this is with schools (like Air Command and Staff College) that are a 12 month PCS. For example, if your family lives in DC and you go to school in Alabama, you can keep the higher DC BAH while you are at that duty station. How can my husband who is a E-4 our child and I get into a newer home at schofield barracks ? I’m an army mom and here in Hawaii to help my 19 year old buy a car. Geez it’s rough at the lots here, the pressure is unbelievable and I’m a pretty tough cookie. Any advice, know of any lots that are decent? I’ve been to Cutter (worst experience ever) and a few others with all bad experiences very pushy and can’t get questions answered without them trying to get me to sign! Ideas? Tips? Help please! Look around at the ‘lemon lots’ at Hickam or MCB Kaneohe. You can also try this site: https://www.militarycarlot.com/base-search/united-states/hawaii/joint-base-pearl-harbor-hickam. Look for ads posted in the base post office as well. Lots of deals to be had from fellow military that take care of their care and need to sell due to a move. The off base car lots are scammers that will either gouge you on price, or hit you with a high interest loan (see step 1 from above). hi, is the lodging allowance rate is already the after gax rate? coz we dont know if lets say we have $265.50 allowance for lodging right now, and the hotel gave us $265 price for the hotel, so does the finance will pay for the tax as well?or we should get a hotel that cost $265 that tax included? Finance will not reimburse taxes separately. So in your case you should try to get a hotel that is $265 with taxes. Keep in mind they do not reimburse parking fees either, and many of the hotels charge a lot for it. The Hale Koa can be good in this regard since parking is only $8 per day for hotel guests. Compare that to Hilton Hawaiian Village next door which is $39 per day. Hey. If possible I would like to verify TLA for food. If the hotel room has a kitchenette but no stove do we get our full TLA for food? Ive heard some say if it has an oven we get half but then some say if we even have a stove top, no oven we would only get half. Hi Heather. Based on the Joint Travel Regulation I would say the lack of a stove means you get full per diem. The JTR says you have to have a stove AND oven to get half per diem. The applicable text of the JTR (http://www.defensetravel.dod.mil/Docs/perdiem/JTR.pdf), section 9185 is below. 1. When temporary lodgings have facilities and space for preparing and eating meals, the daily TLA rate is computed using par. 9185-E, except that the M&IE amount is reduced by one half. 2. The reduced (one half) M&IE amount based on adequate cooking facilities does not apply when lodging is provided by a friend/relative, or to the first and last days of TLA. 3. The presence of a stove and oven, work area (table, counter, etc. ), refrigerator, sink, water, table, chairs, and cooking and eating utensils (i.e., all of the foregoing items) is evidence of adequate cooking and eating facilities. 4. When the member shows, to the satisfaction of the official designated in the local TLA regulations (see par. 9150) that the facilities for preparing and consuming meals are inadequate or for other reasons may not be used for all or part of the period involved, the member may be authorized TLA per par. 9185-E, without the M&IE reduction. The member’s explanation for facilities non-use, endorsed by the OCONUS TLA Authority’s designated official supports TLA payment under these circumstances. Good afternoon, I have a question for you about COLA. Am I still entitled to COLA if I live in base housing with my family, not the barracks. Thank you in advance. 7. Does the type of housing I occupy affect my COLA? Yes. If you are a member without dependents living in government quarters such as the barracks or aboard ship, you will receive less COLA to reflect your lower living expenses. If you are a member with accompanying dependents living in either on-base family housing or off base housing, your COLA will not be affected. Hello, I have a question. We have a letter of non-availability for the first 5 days when we get to hI because the base/TLA hotels were booked. Are we allowed to stay at ANY hotel and they will reimburse up to the maximum? Does it need to be a certain proximity to base? If my husband and I wanted to stay at Turtle Bay and pay the difference that TLA won’t cover out of pocket, could we? Yes, you can stay at any hotel and they will reimburse you up to the maximum. I believe the only limitation on location is that it would have to be on the island of Oahu. So yes, there should be no issue with Turtle Bay. We stayed at Disney’s Aulani Resort for a portion of ours and paid the difference since TLA did not cover the entire amount. This is not true. You can not stay at any hotel and get reimbursed. There is a list of TLA approved hotel. If you send me your email I will forward it to you. Good evening, I do not have a GTCC but I’ll definitely need TLA to be able to pay for Schofield Inn. How does his work? Will I have to pay out of pocket and be reimbursed every 10 days? Yes Schofield Inn requires you to pay up front. Some hotels like the Best western in Honolulu will let you stay there and you pay them when you get your TLA money back. Yes I would stay in a hotel (or billeting) for 60 days. You can remain on TLA the entire time and make some good money while waiting. Staying on base has a lot of advantages in Hawaii and I highly recommend it. Do we need to complete the housing search sheet every 10 days for the next 60 days? So do you get paid money for a hotel up front? Or do they just pay you back? This will be my 2nd duty station and I’m just wondering because I’ll be coming with my wife and three children. So how does that work. Is it hard to get a house if you don’t have good credit how much does stuff range out there? We were offered 2 houses weeks apart of each being available. The first house we want to turn down because the 2nd offer was a brand new built house on base. Would our TLA end when we deny? Because we still have 6+ more weeks to have an available house regardless of which house we pick. We are from Hawaii and my husband went to bootcamp but we haven’t been receiving cola and now that he’s at school he asked his command and they said we don’t get cola. Is this correct because there is cola for hawaii and since me and our daughter are living here it doesn’t make sense that we wouldn’t get it. COLA is based off of his duty station, not the dependent location. So if he was to get stationed back here in Hawaii, then yes you’d get COLA along with other allowances. But since he is still at a training command, he rates BAH for the location where his dependents live. Which is why you guys are getting Hawaii BAH. Hello. I have two questions for you. 1) I just spoke to a hotel rep from the TLA authorized hotel list about resort fees; they informed me that the military will now cover resort fees as part of TLA. Just want to confirm if this is true. 2) Is an SNA mandatory for those assigned to bases/posts with no designated transient hotels? Resort fees were always covered as far as I know. The person to verify that is your on-base TLA coordinator, not a rep with the hotel. As for SNA I assume you mean non-availability letter? A non-availability letter is required for Air Force personnel, in order to prove that on-base lodging was unavailable during your stay. I’m not sure how the other services do it. My hubby and I are dual military and I think its awesome that this website is available to help military members!! Thank you!! first, great post here! am considering hawaii for a base of preference and in middle of a deployment myself. thing i’m curious of … would it be possible to pocket the entire bah/tla/cola if one were to pcs over with a converted travel van? would jtr cover shipment of a smaller trailer (storage) or any sort of travel trailer? Hi Robin. I’m glad you like the site! Hawaii BAH and COLA are just like CONUS allowances, in that you can spend the money however you want. So you can live in a mansion, a camper, or on the beach in a tent and receive the same amount of money. TLA is a little different. I believe you would receive per diem (food) while staying in a travel van, but you will not be reimbursed for any lodging cost due to the lack of receipts. According to the TLA FAQ here, lodging receipts are required to claim lodging expenses, and if staying with friends or relatives your reimbursement for lodging is 0. Although you are not staying with friends I believe you would fall under that category. You could ship the travel trailer to Hawaii yourself. I shipped a second vehicle using Pasha and it was around $1,500. I expect a travel trailer would be more. I will tell you that travel trailers, campgrounds, etc are not really a ‘thing’ on the island of Oahu. I would research if there is anywhere available to park it and how much that would cost. The travel van sounds much more feasible. Either way I think you have an interesting idea because your monthly allowances will come to $4K a month so you can do a lot with that kind of money. Good luck to you and let me know if you have any other questions! My name is Tara and I applied for a military job because I was a veteran back in 2000. Do civilians that work at the Army clinic qualify for base housing? I have a wife and 2 kids under 12 and getting ready to move to Hawaii but going unaccompanied, how will TLA and Cola work in my case. Hi Russ. Most forms ask you how many dependents are staying in the hotel with you. They will only pay you TLA for who is with you. So I would say you will get allowances based on single occupancy. I was house hunting for 30 days off post housing and put .e on on post housing waiting list. Finally, I was able to get a leasing contract within 30 days. However, the contract was canceled because of land load increased rent with sepetated water bill. Luckily, a on post house was available after 86 days, and we moved in on post housing. The housing office provided only 60days memo for TLA. The last TLA memo says a final 6th TLA. Is it possible to receive extra 26 days TLA after 60days? I’ve heard of some people going beyond 60 days of TLA but it’s not common. I believe it’s completely up to your TLA approving representative on base. I have a question. I am living on base and my family will be owing a house in WA state. How much BAH will I get (the HI amount or WA amount) and what options do I have for on base housing at little to no cost to myself? Thanks! Hello! I’m trying to find out more information on relocating to Hawaii. I’ll be tranferring to my next duty station in Kaneohe and wondering how to register for TLA. Am I allowed to arrive in HI during my 30-day tranfer leave and be eligible for TLA? I’m so confused on how this will work and my current duty station keeps giving me mixed answers.. Your posts have been very helpful. I did have one TLA question and perhaps I overlooked it, if staying with a friend/family you can only get TLA for meals correct and not anything additional (lodging) to pay your friend/family member while you stay there correct? I had a question about dual military and not being co-located. I’m set to be stationed in hawaii (I’m army and my husband is navy) hes stationed in norfolk, but I was recently told that I wouldn’t received BAH when I get there because I would be considered a geo bach and that’s no longer an official title. But I thought we were still considered mil to mil family? With no kids. He’s the higher rank so I know he gets paid more and I’ll recieved single bah with no dependents. I have a question about booking a hotel room while we wait for a home! I’m an Amex Platinum member and I would like to make our reservation through the amextravel.com website if I can to earn 5X membership rewards points. Have you heard of any problems from people not being paid TLA since online receipts are not accepted from websites such as expedia.com, hotels.com etc. Also, any experience with Amex hotel modifications since housing availability is up in the air? Say we make a reservation for 3 weeks, but our home is ready in two so we cancel the remainder of our prepaid reservation. Of course we would be subject to hotel cancellation policy, but how that affects Amex? I transfer from the island to Norfolk in Dec. I understand that I am entitled to BAH and TLA for 10 days prior to leaving the island. I will be taking leave in conjunction with my travel and proceed to VA. My question is, how long will I continue to receive Hawaii BAH? I don’t intend on checking into my new command in VA until the end of December. Will I continue to receive BAH while on travel? If it matters, I own a home in Florida where my daughter and ex-wife live that is in my name. I believe I would still be authorized BAH since I continue to own a home. Thanks! Where did you find the TLA Pay Chart? Just so I’m clear. As of today, 10 Mar 2019, Honolulu per diem rate is $177 lodging and $138 M&IE. For the member and 1 dependent with a 10, 14, & 18yo, we are entitled to 195% of lodging & M&IE. If we cannot move into on-base housing for 30 days, we are therefore entitled to $8073 for M&IE, correct? This is in addition to the BAH entitlement? Seems legit. Bad gouge…. You are not entitled to BAH and TLA simultaneously (assuming you do not get it for dependents in your previous duty station [Geo Bachelor]). You will get both at the same time sometimes only due to slow processing of turning off BAH at the last duty station and being in-transient (all depending on leave taken in route, etc) but you will have to pay that BAH back since you received TLA once you arrived to the new duty station for the days you were staying in the hotel. You do start receive OHA (overseas) until you have signed a lease, and since you would have signed a lease, you are no longer entitled to TLA.